Football season lasts for five months and what better way to end it than with a SuperBowl win! (Six months with pre-season, but we usually don't watch many of the pre-season games.) Five months of absolute dedication to football on Sundays. Kind of crazy, some might even consider it a waste of time, but it's become a way of life for us. And it's fun. We enjoy the rituals of getting ready for each game and then spending a few hours cheering and shouting and cursing at the television. Our love of the Steelers and of the game itself has also brought new and interesting people into our lives. There's nothing quite like football on Sundays. There should be 20 pictures in the Game Day Series, but I missed taking a shot during the second week of the season when we were at the beach. At that time, I don't think I realized that the photo from the first week was actually the beginning of a project for the season. I don't think the series is particularly strong, but I am happy with myself for sticking to it and taking a photo every Sunday even when I wasn't feeling particularly inspired. It's hard to take a different shot of the same thing every week. And I don't know that I succeeded in doing it, but it was a good challenge for me and I am quite fond of some of the shots. Who knows, maybe I'll do something like it next season as well. As much as we love our football on Sundays, I don't think we'll experience too much withdrawal now that it's all over. For one, we are still reveling in the fact that we are World Champions! I'm still not tired of watching highlights of the game on NFL Total Access. And frankly, by the end of the season, we usually need a break. Hosting a group of friends every week is something that we love to do, but it wears us out too. Which is also why we remain dedicated only to football. We just don't have the energy to add another sport! And let me tell you, I missed being in Pittsburgh at that moment. I wanted to be able to run out in the street and whoop it up with everybody else. But no, we're far far away in the southwest and there was plenty of whooping inside, but not so much on the street. 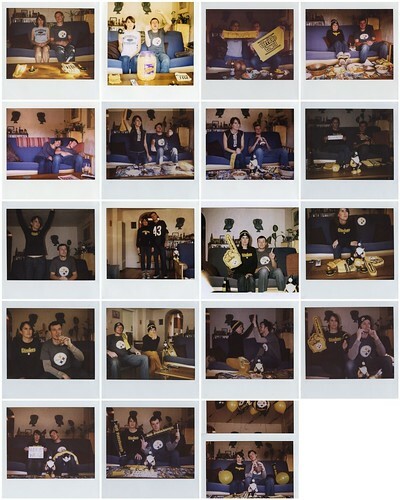 There's nothing like Pittsburgh with a SuperBowl win. (I guess we could have taken the couch outside and burned it. Heh.) I wish I could have see the parade too. Instead, to fill that void, I ordered a couple new t-shirts and bar glasses for our collection. STEELERS! Granny is a Steelers fan, and she was absolutely impossible to live with this postseason. That's all I ever heard about.